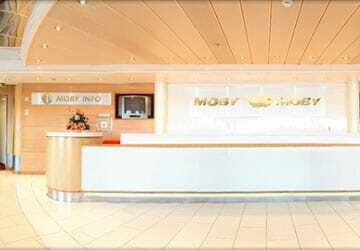 The Moby Tommy is part of the Moby Lines fleet of luxurious fast cruise ferries which means it features top class amenities! 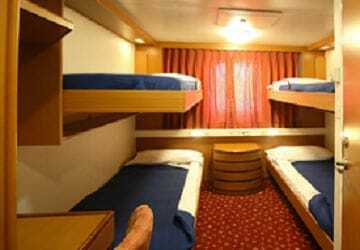 There's a choice of en-suite cabins, coach style seats, à la carte and self-service restaurants, pizzeria, gelateria, cafeteria, sport bar and pub, children's world with video games, onboard shop and a swimming pool with sundeck. 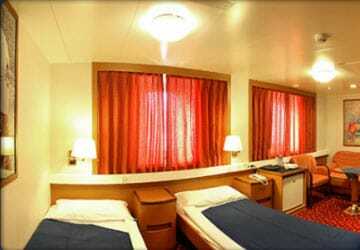 Moby Tommy features a selection of air-conditioned en-suite cabins with a choice of inside or sea view ('outside'). 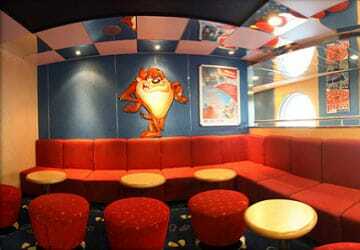 There is also a reserved seating area equipped with coach seats for those who'd prefer not to book a cabin. 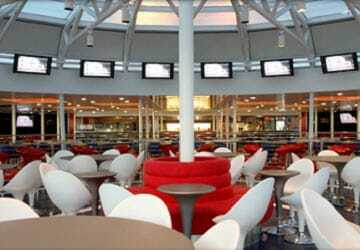 In the à la carte restaurant there is a selection of delicious meals whilst the self-service restaurant offers a range of freshly cooked dishes, including a fun children's menu. Authentic Italian pizza is available at the pizzeria and there is also a cafeteria and a gelateria (ice cream parlour). 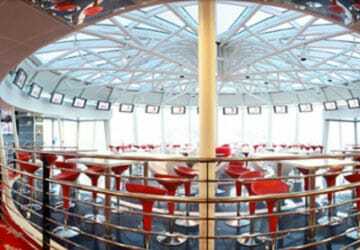 There are plenty of places to enjoy a drink onboard Moby Tommy too including the sports bar with a big screen TV and the Admiral pub. You can also top up your tan whilst enjoying a cold drink on the sun deck. There's a large selection of high street goods on offer in the Moby Tommy shopping centre including clothing, children’s toys, maps, magazines and books. Moby Tommy has a swimming pool with a sundeck. When children travel with Moby Lines they'll experience a trip into a world of imagination, not least due to the Looney Tunes branding and figures which can be found everywhere onboard. 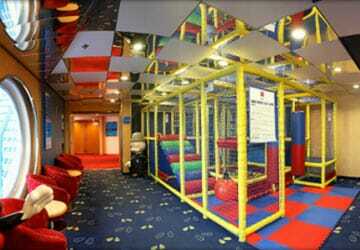 Moby Tommy has a dedicated children’s play area known onboard as 'Children's World'. The videogames rooms are bursting with games for older children too. If you will require assistance during your trip then you must specify this at time of booking and ensure that you arrive at the port at least two hours before the departure time to discuss requirements with the check-in staff to ensure that your vehicle can be parked within easy reach of access ways and assistance provided during boarding and disembarkation. Please Note: Whilst we have taken great care in making our Moby Tommy guide as accurate as possible, onboard facilities, services and entertainment may vary depending on the date and time of year that you travel, facilities mentioned may change without notification and ferry companies reserve the right to operate vessels other than those mentioned at time of booking without prior notification. Nice journey, clean and punctual ferry. A lots of services on board. "Piombino - Olbia and return"
A very nice ship, everything went well and we enjoyed our crossing. after the shocking trip with Tirrenia few years ago, with dirty cabins and bad food, this time I travelled with Moby and I loved it. On time, beautiful ship. Air conditioning too strong. 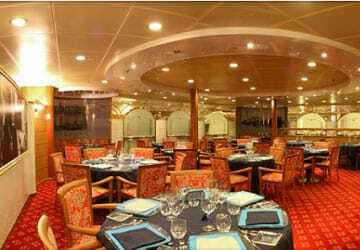 Excellent ship, I had fun during the time on board, just 5 hours, going around. Self-service restaurant very expensive, shame. The barman often seemed bothered when you asked them for a simple coffee. The lavatories were very clean, the cuisine was good and the prices were reasonable. 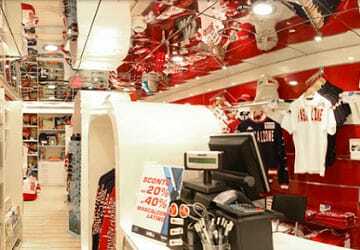 We've had good experiences with Moby Lines before and their good customer service was confirmed once again. No need to go and collect tickets from an office on arrival at the port, but straight on to the queue, handover your reservation confirmation and your ticket is printed on the spot. 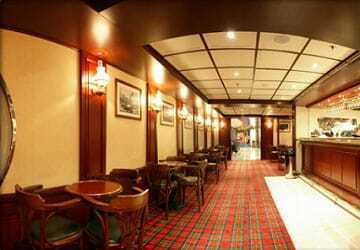 What's exceptional is how friendly all staff on the ship is, and they all try to speak English. The announcements are also bilingual, in Italian nad English. 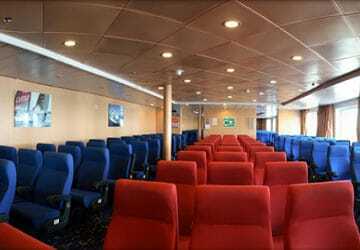 The ferry is very clean, modern, spacious and with ample seating. Unfortunately there are no chairs on the outer decks, so it's advisable to bring a folding chair. The ship departed right on time. 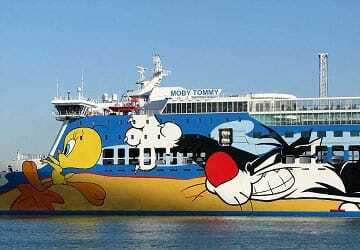 Moby Lines is a fine example to other ferry companies going to Sardinia. We were scared about it, but all good once onboard. 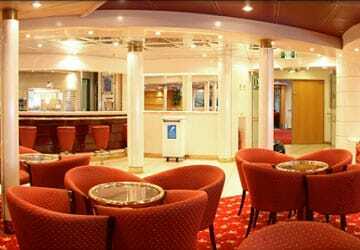 The ferry was punctual, clean and friendly staff, it was very well equipped with the armchairs to have some rest. "Round Trip Piombino-Olbia August 2013 "
The ferry had a delay on the outbound journey. Perfect from Olbia to Piombino, while from Piombino to Olbia we had to get the tickets at the check-in, instead of from the tickets machine. For the rest was all good, except for toilets, on the return trip, on the outside deck, were obscene. Clean them sometimes!!! I'll take this company again as soon as I have the opportunity. Prices are too high if compared to the services offered. The ferry on the return arrived with a h1.5 delay, it was overcrowded (it shouldn't accommodate so many passengers if the seats are not enough to face a h5/6 trip). Toilets were dirty. For the same price I could have taken a Grimaldi ferry Barcellona-Civitavecchia with a cabin and car. I think they should improve the service!!! We travelled on Moby from Olbia to Livorno in May 2013 and it was great! And way better than the journey we took from Civitavecchia to Olbia the week before (Tirrena line). 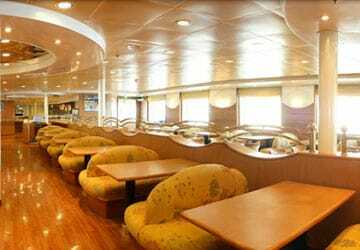 An extremely nice and well equipped ferry, the Moby experience was great. 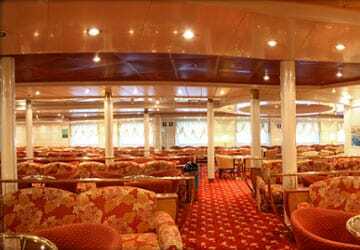 The berth we had was,clean and quiet; the sports bar was great and a, UEFA Cup semi final on the big screen was an added bonus. I'll travel via Moby again!!! Unfortunately, it had no deck chairs on the deck, thus almost no seating. Good crossing, maybe though they could put a bit more German translations around.